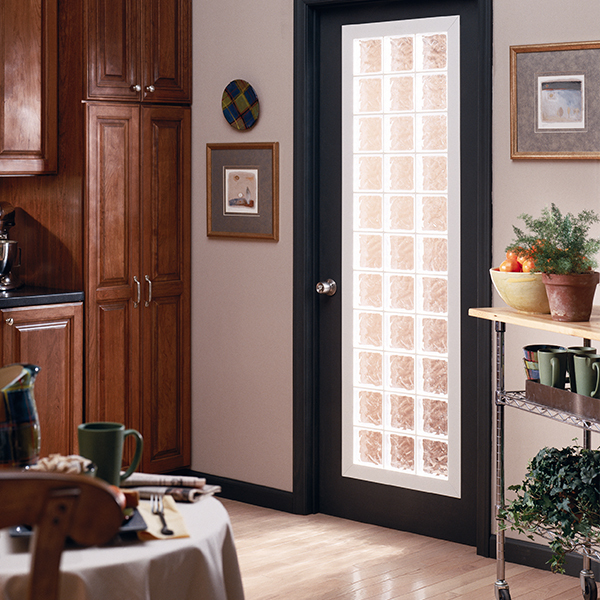 Don't trap light outside your home ... bring it indoors with acrylic block door inserts. Available in 11 different sizes, Hy-Lite's acrylic block door inserts can easily be installed in both interior and exterior doors. Have a home office that feels too "closed in" when the door is closed to keep the kids out? Add an acrylic block door insert. Want to bring light into your kitchen but keep nosy neighbors outside? Add an acrylic block door insert. Have a rear entry door that opens into an unsightly alleyway or overlooks an ugly HVAC system? Add an acrylic block door insert! Available in Wave, Glacier and Cross Rib block patterns, Hy-Lite acrylic block door inserts are fast and easy to install. They help transform a dark room in the home into a stylish room encouraging the flow of light. And, don't forget that you can find the same solution to adding privacy to your home with acrylic block windows. Just replace any window with an acrylic block fixed or operable window and you get diffused light flowing into your home!